Glebe Rangers manager Jason Wilmont and Linfield manager David Healy at the draw for the fifth round of the Irish Cup. Glebe Rangers boss Jason Wilmont got the draw he was looking for after his side were paired with holders Linfield in the fifth round of the Irish Cup. The Ballymoney men will travel to Windsor Park to take on David Healy’s men in the cup on January 6th. Wilmont was delighted to land the Premiership giants in the showpiece cup competition. “It’s a fantastic draw for us,” he told Times Sport after the draw was made by Dessie Dickson and Glenn Ferguson. “We wanted either Coleraine or Linfield, and we got Linfield so we couldn’t ask for any better. “We played here a couple of seasons ago in the League Cup, but the stadium wasn’t finished at the time. “Looking at the stadium now we are dying to get back here. “We will be going to enjoy the day, we will bring a big support with us and it will be a brilliant day out for the club as a whole. “As I say will will be coming to enjoy it as that’s what it is all about. “It’s great for everyone at the club, we can all go and enjoy our Christmas now knowing we will be coming up to play Linfield the following week. 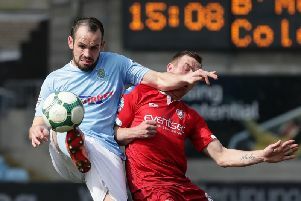 The Glebe will be hoping to carry their impressive Ballymena and Provincial League form into the game against the Blues. “We are unbeaten in the league so far this season, we are a few games behind because we have been doing so well in the cups,” he said. “It can be a wee bit of a hindrance, but when you come and get a draw like that it makes it all worthwhile. “We will come here and try our best but we know it’s going to be a very tough challenge for us. “If we can apply ourselves right, which I know the players will, and go and enjoy it. “There’s no pressure on the players, it gives everyone a real boost being involved in a game like this.